CITY IN THE SKY goes behind the scenes with rare access to uncover the invisible global networks and complex logistics that have allowed air travel to soar to new heights. At any given moment, more than one million people are traveling by airplane, in 100,000 daily flights moving 30,000 feet above the Earth. This airborne metropolis and the armies of professionals needed to make it all work are captured in CITY IN THE SKY, a three-part documentary series co-produced with BBC. From hidden cities of luggage below ground to the steady hands guiding flights around the globe, CITY IN THE SKY goes behind the scenes with rare access to uncover the invisible global networks and complex logistics that have allowed air travel to soar to new heights. From the coldest airport in the world (in Yakutsk, Russia), to one of the busiest (in Atlanta, Georgia), to the most dangerous (in the Himalayan town of Paro), the series takes viewers to remote, little known places such as the world’s largest luggage storage facility and the storage tanks in Europe and southeast America that hold and transport millions of gallons of jet fuel through underground pipes. The Bangor, Maine International Airport, which boasts the size of a major international hub because it serves as the first U.S. point of arrival for troubled airliners crossing the Atlantic Ocean. Episode 1 “Departure” – Learn what it takes to get a million people off the ground—from building the world’s biggest passenger plane to controlling the flow of passengers through the busiest airport on the planet to the perils of takeoff in the coldest city on Earth. Episode 2 “Airborne” – Examine the hidden army that keeps your plane safe, and explore just what it takes to keep the “city in the sky” functioning and safe between take-off and landing. Learn why flying has become safer than ever. Episode 3 “Arrival” – What goes up must come down—and getting passengers safely back to earth depends on complex global networks and some astonishing technology. 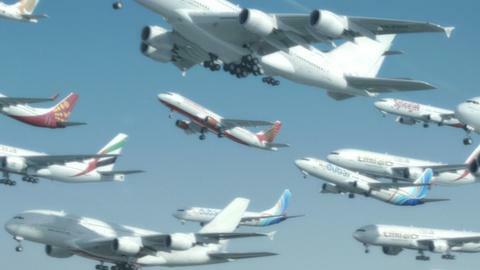 Around the world, 100,000 flights a day make touchdown—almost every one safely. Learn what’s involved.